As I detailed previously, I was sufficiently inspired by the Marvel Studios Phase 3 announcements to embark on a quest to familiarize myself with the adventures of the Prince of Wakanda. Last week covered the lunacy that was the Jack Kirby run as artist and writer. Next up, I decided to take a sizeable chunk out of writer Christopher Priest’s Black Panther series. The early part of the book had its moments, such as taking down Mephisto with one punch, or Hulk as club hopper, but the (forced upon him) method of storytelling got to be too annoying. 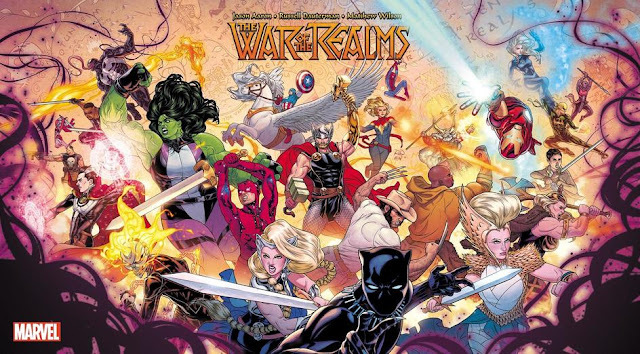 Fortunately, I skipped ahead to the “Sturm Und Drang” story in issues #26-29, an exciting tale about a standoff between Lemuria, Atlantis, and Wakanda. 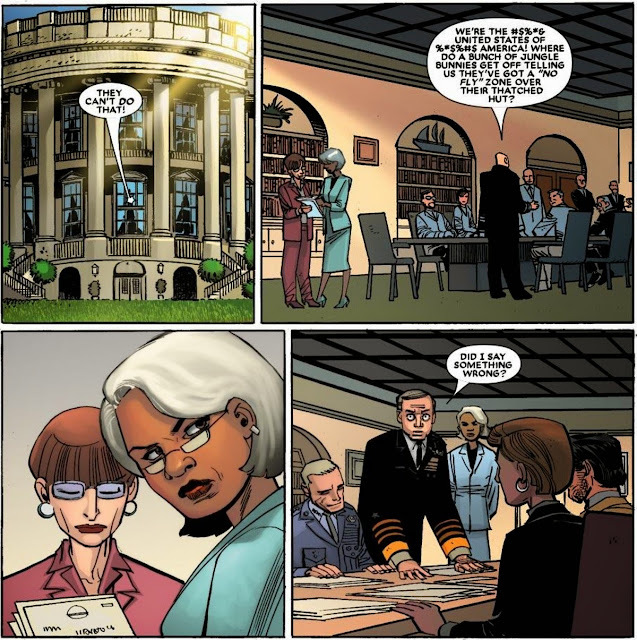 The story was filled with enticing scenes of politics between Magneto, Black Panther, Dr. Doom, and Namor. As boring as that might sound, I assure you I am totally serious when I say I could read that on a monthly basis. 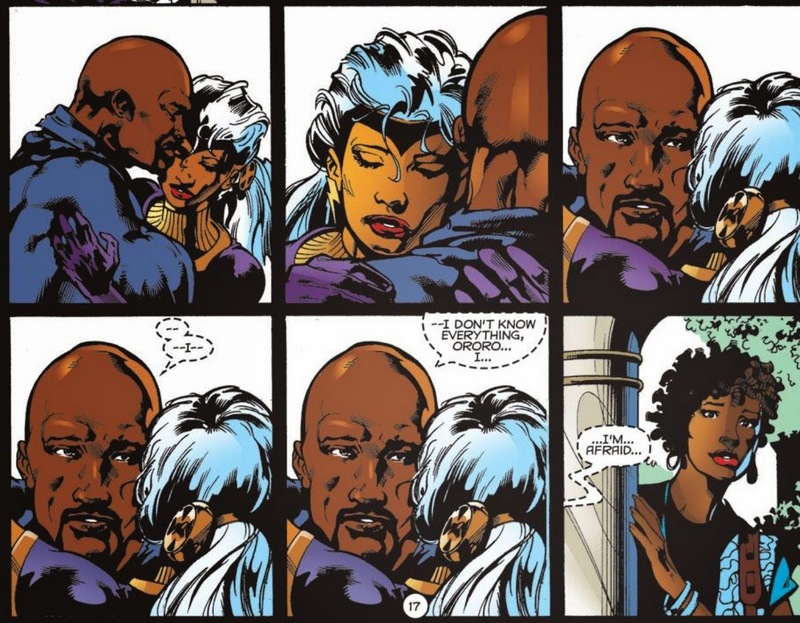 Plus, the relationship between Storm and Black Panther was further developed, something I had always thought was forced upon the characters later on. 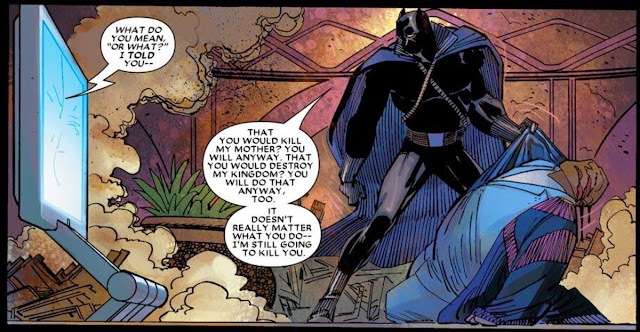 T’Challa has a rare moment of transparency and vulnerability as well, which I found really powerful. Next on the docket was the acclaimed “Who is the Black Panther” by Reginald Hudlin and John Romita Jr. Hudlin is not a writer I had much confidence in, since his only work I’d read previously was as part of the worst era in Spider-Man history, but he crafted an entertaining and subtly provocative story here. I tend to have a like/hate relationship with modern Romita Jr., but he’s competent enough here to not be distracting. The plot is simple enough. Framed around a retelling of the origins of Black Panther and Wakanda, Klaw assembles an invasion force including himself, Rhino, Batroc, Radioactive Man, and the Black Knight. 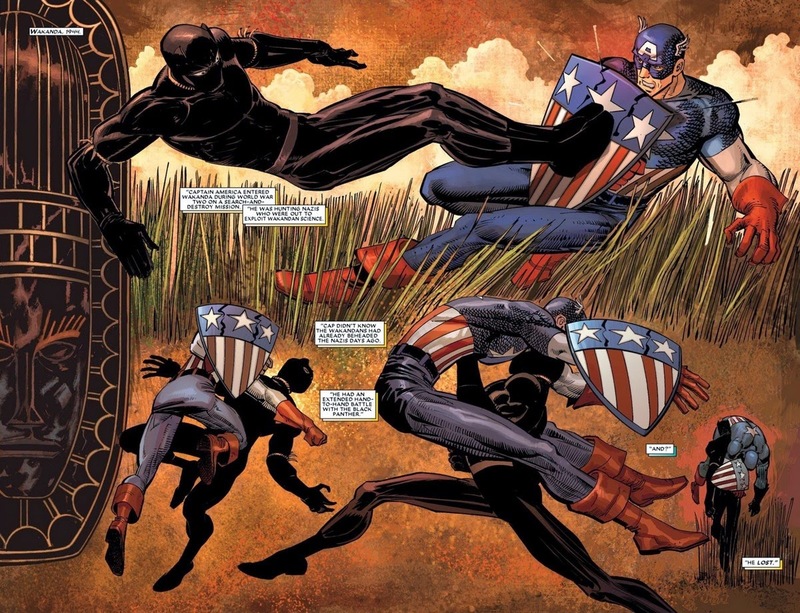 One of the things I like most about the Black Panther in my short time reading him, is how competent he is portrayed. (This shouldn’t really be something that impresses a superhero comic book reader, but you have to remember I grew up reading Spider-Man and X-Men.) He is basically the Marvel equivalent of Batman much more than Captain America is, something I am told angers Batman fans to no end. (Knowing this pleases me.) Panther always has a plan, and even when things don’t seem to be going to plan, it was always a part of his plan anyway. 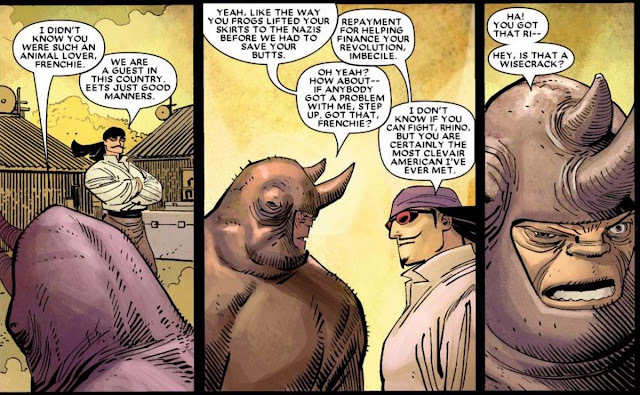 Another interesting part of Hudlin’s storytelling, is how ugly and racist some of the characters are shown to be. 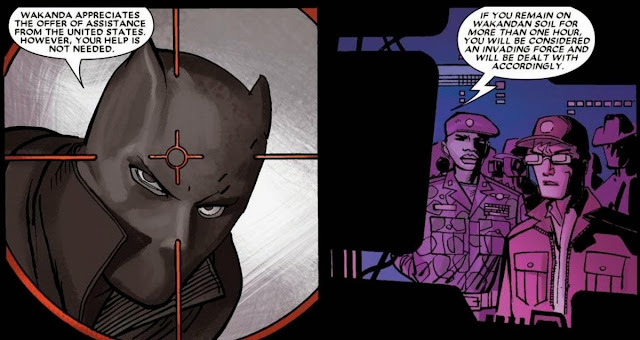 Most comic book writers tend to be white males, so there can be an understandable level of trepidation for one of them to consider writing “jungle bunnies” into a script for Black Panther. This often means that the ugliness and racism that still exists in our society is sometimes overlooked or not addressed. It’s not the type of thing I’d find entertaining to read about as the center of a story’s plot, but including it in the margins, gave the story a level of authenticity that’s not often achieved. Racism is ugly, and it still exists, no matter what you want to believe. Alongside that, is a depiction of the U.S. government and military that I regretfully find completely believable (to a point). Despite Wakanda never attacking any force that wasn’t already at their borders, that doesn’t mean that tomorrow they won’t decide to invade other countries and take over the world, at least in the eyes of American military leaders. There used to be a time when our country used its military power to do the right thing, not to consolidate more power and resources (or use the bodies of dead soldiers to make a cyborg army). At least that’s the viewpoint of this superhero comic, so feel free to agree or disagree at your leisure. 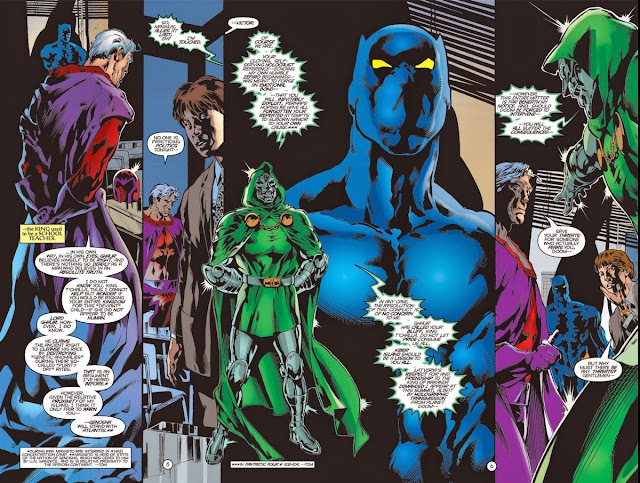 I liked Black Panther’s philosophical religious question here, if only because I think there are way too many athletes that think God really wanted them to win whatever game they’re playing. Overall, Hudlin and Romita delivered an entertaining and engaging superhero comic book story. If you’re not immediately drawn in by the promise of Batroc and subtle racism, I don’t know what else I can tell you. Body-swapped prostitutes play a role, for those needing a little extra incentive. I’m going to continue with my Black Panther reading, so if there’s anything I feel significantly inspired to write about, we’ll cover that next time. If not, may the Black Knight have mercy on your racist soul.